The 2003 California gubernatorial recall election was a special election permitted under California state law. It resulted in voters replacing incumbent Democratic Governor Gray Davis with Republican Arnold Schwarzenegger. Davis was ineligible to run for a third term due to term limits after the recall election. The recall effort spanned the latter half of 2003. Seven of the nine previous governors, including Davis, had faced unsuccessful recall attempts. After several legal and procedural efforts failed to stop it, California's first-ever gubernatorial recall election was held on October 7, and the results were certified on November 14, 2003, making Davis the first governor recalled in the history of California, and just the second in U.S. history (the first was North Dakota's 1921 recall of Lynn Frazier). California is one of 19 states that allow recalls. 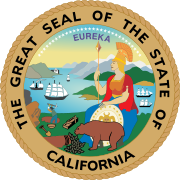 The California recall process became law in 1911 as the result of Progressive Era reforms that spread across the United States in the late 19th and early 20th centuries. The ability to recall elected officials came along with the initiative and referendum processes. The movement in California was spearheaded by Republican then-Governor Hiram Johnson, a reformist, who called the recall process a "precautionary measure by which a recalcitrant official can be removed." No illegality has to be committed by politicians in order for them to be recalled. If an elected official commits a crime while in office, the state legislature can hold impeachment trials. For a recall, only the will of the people is necessary to remove an official. Nineteen U.S. states, along with the District of Columbia, allow the recall of state officials, but Davis' recall at the time was only the second in U.S. history. The first governor recall occurred in 1921, when North Dakota's Lynn J. Frazier was recalled over a dispute about state-owned industries, and was replaced by Ragnvald A. Nestos. The third recall occurred in Wisconsin in 2012. Under California law, any elected official may be the target of a recall campaign. To trigger a recall election, proponents of the recall must gather a certain number of signatures from registered voters within a certain time period. The number of signatures statewide must equal 12% of the number of votes cast in the previous election for that office. For the 2003 recall election, that meant a minimum of 897,156 signatures, based on the November 2002 statewide elections. The effort to recall Gray Davis began with Republicans Ted Costa, Mark Abernathy, and Howard Kaloogian, who filed their petition with the California Secretary of State and started gathering signatures. The effort was not taken seriously until Rep. Darrell Issa, who hoped to run as a replacement candidate for governor, donated $2 million towards the effort. This infusion of money allowed Costa and Kaloogian to step up their efforts. Eventually, proponents gathered about 1.6 million signatures, of which 1,356,408 were certified as valid. Under most circumstances in which a recall campaign against a statewide elected official has gathered the required number of signatures, the governor is required to schedule a special election for the recall vote. If the recall campaign qualified less than 180 days prior to the next regularly scheduled election, then the recall becomes part of that regularly scheduled election. In the case of a recall against the governor, the responsibility for scheduling a special election falls on the lieutenant governor, who in 2003 was Cruz Bustamante. Davis had accepted $2,000,000 from the California Correctional Peace Officers Association, and used his political connections to pass an estimated $5,000,000,000 raise for them over the coming years. That led many people throughout California to believe Davis was guilty of corruption, even if he did not meet the standard necessary for prosecution. The entire United States and many of its economic trading partners had been in economic recession. California was hit harder than other states at the end of the speculative bubble known as the "dot-com bubble"—from 1996 to 2000—when Silicon Valley was the center of the internet economy. California state expenditures soared when the government was flush with revenues. Some Californians blamed Davis and the state legislature for continuing to spend heavily while revenues dried up, ultimately leading to record deficits. Also, the California electricity crisis of 2000–2001 caused great financial damage to the state of California. There is much consternation among the citizens of California regarding Davis's handling of the crisis; see that article for more. The legal issues still were not resolved in time to alleviate California's dire need for electricity, and the state instituted "rolling blackouts" and in some cases instituted penalties for excess energy use. In the recall campaign, Republicans and others opposed to Davis's governance sometimes charge that Davis did not "respond properly" to the crisis. In fact most economists disagree, believing that Davis could do little else—and anyone in the governor's office would have had to capitulate as Davis did, in the absence of Federal help. The Bush administration rejected requests for federal intervention, responding that it was California's problem to solve. Still, subsequent revelations of corporate accounting scandals and market manipulation by some Texas-based energy companies did little to quiet the criticism of Davis's handling of the crisis. Furthermore, there is a high correlation between the success of the recall signature gathering effort and the inability for the California Legislature and the governor to agree on a new state budget. The new year's California budget was finally passed on August 1, 2003, several days after the recall drive qualified, and many[who?] believe the deadlock involved in the budget negotiations added fuel to the fire driving the recall effort. Some[who?] were further antagonized by the fact that the budget ultimately passed relied on loans and borrowing—which they[who?] said amounted to not fixing California's budget problems at all. Additionally, many Republicans[who?] believe that California's taxes are too high, discouraging investment and driving businesses out of the state. Many candidates[who?] also criticized Davis's immigration policy, and were particularly enraged by Davis's seeming support of the court ruling striking down most of Proposition 187 as unconstitutional and his more recent support for issuing driver's licenses to illegal immigrants. Many other California governors[who?] have faced recall attempts and many others[who?] have governed through tough economic circumstances, but none ever faced a special recall election until Davis. Some political experts believe a "perfect storm" of circumstances led to the success of the recall drive. In the 2002 primary election, Davis ran unopposed for the Democratic nomination. He spent his campaign funds on attack ads against California Secretary of State Bill Jones and Los Angeles mayor Richard Riordan, the two well known moderates in the Republican primary. The result was that his opponent in the general election was conservative Republican and political newcomer Bill Simon, who was popular within his own party but unknown by the majority of the state population. The intense criticism of both candidates caused Davis and Simon to run one of the most negative campaigns in recent state history. The attacks on both sides turned off voters and suppressed turnout; Davis ultimately won with 47% of the vote. The suppressed turnout had the effect of lowering the threshold for the 2003 recall petition to qualify. A hot button issue that seemed to galvanize the public was the vehicle license fee increase Davis implemented under provisions of legislation passed by his predecessor which originally reduced the fees. On June 20, 2003, the Davis administration reinstituted the full vehicle license fee, and to date the action has withstood legal challenge. The action was a key step in the plan to close the $38 billion shortfall in the 2003–2004 budget. The increase tripled the vehicle license fee for the average car owner, and began appearing in renewal notices starting August 1. The California state budget passed in late July 2003 included the projected $4 billion in increased vehicle license fee revenue. On February 5, 2003, anti-tax activist Ted Costa announced a plan to start a petition drive to recall Davis. Several committees were formed to collect signatures, but Costa's Davis Recall Committee was the only one authorized by the state to submit signatures. One committee "Recall Gray Davis Committee", organized by Republican political consultant Sal Russo and former Republican assemblyman Howard Kaloogian played a smaller role in drumming up support. Kaloogian served as chairman, Russo as chief strategist of the committee. After the recall both Kaloogian and Russo went on to found Move America Forward. Later that month, the committee's periodic e-mail said that state funds were being illegally used to fight the recall effort. In particular, four million dollars of California State University funds were said to have been funded to educate union members in "Workers Against Recall" or "WAR." Recall supporters organized an authorized (licensed by local police) march opposite a hotel hosting a WAR seminar on August 15, 2003. News video showed a dozen union members with WAR T-shirts crossing the street and assaulting marchers, sending one to a hospital. The low requirements attracted many "average joes" with no political experience to file as well as several celebrity candidates. Many prominent potential candidates chose not to run. These included Democratic U.S. Senator Dianne Feinstein, widely regarded as the most popular statewide office-holding Democrat in California, who cited her own experience with a recall drive while she was mayor of San Francisco. Darrell Issa, who bankrolled the recall effort and said he would run for governor, abruptly dropped out of the race on August 7 among accusations that he had bankrolled the recall effort solely to get himself into office. Issa claimed that Schwarzenegger's decision to run did not affect his decision and he dropped out because he was assured that there were several strong candidates running in the recall. The San Francisco Chronicle claimed that Davis's attacks on Issa's "checkered past" and polls showing strong Republican support for Schwarzenegger caused Issa to withdraw. Former Mayor of Los Angeles Richard Riordan and actor Arnold Schwarzenegger (a fellow Republican) agreed that only one of them would run; when Schwarzenegger announced on The Tonight Show that he would be a candidate, Riordan dropped out of the race. Riordan was surprised and those close to him say angered when he learned Schwarzenegger was running. Riordan did end up endorsing Schwarzenegger, but his endorsement was described as terse and matter-of-fact in contrast to his usually effusive way. State Insurance Commissioner John Garamendi (a Democrat) announced on August 7 that he would be a candidate for governor. However, just two days later and only hours before the deadline to file, he announced "I will not engage in this election as a candidate", adding, "this recall election has become a circus." Garamendi had been under tremendous pressure to drop out from fellow Democrats who feared a split of the Democratic vote between him and Lt. Gov. Cruz Bustamante should the recall succeed. On September 3, five top candidates—independent Arianna Huffington, Democratic Lt. Gov. Cruz Bustamante, Green Party candidate Peter Camejo, Republican State Senator Tom McClintock, and former baseball commissioner Peter Ueberroth—participated in a live television debate. Noticeably absent was Arnold Schwarzenegger who opponents charged was not adequately prepared. Schwarzenegger had repeatedly stated that he would not participate in such events until later in the election cycle. Prior to this first debate, Gov. Davis spent 30 minutes answering questions from a panel of journalists and voters. On September 24, the remaining top five candidates (Schwarzenegger, Bustamante, Huffington, McClintock, and Camejo) gathered in the University Ballroom at California State University, Sacramento, for a live televised debate that resembled the red-carpet premiere of a movie in Hollywood. Schwarzenegger's marquee name attracted large crowds, a carnival atmosphere, and an army of hundreds of credentialed media from around the world. While the candidate and his staff rode on buses named Running Man and Total Recall, the reporters' buses were named after Predator. A lawsuit filed in Los Angeles by the American Civil Liberties Union (ACLU) claimed that the use of the "hanging chad" style punch-card ballots still in use in six California counties (Los Angeles, Mendocino, Sacramento, San Diego, Santa Clara, and Solano) were in violation of fair election laws. U.S. District Judge Stephen V. Wilson in Los Angeles ruled on August 20, 2003, that the election would not be delayed because of the punch-card ballot problems. There was an estimate that up 40,000 voters in those heavily minority districts might be disenfranchised, if the election were not postponed to remedy the difficulty. His ruling was appealed, and heard by three judges in the 9th U.S. Circuit Court of Appeals. On September 15, the judges issued a unanimous ruling postponing the recall election until March 2004, on the grounds that the existence of allegedly obsolete voting equipment in those six counties violated the equal protection constitutional guarantee, thus overruling the lower district court which had rejected this argument. Recall proponents questioned why punch-card ballots were adequate enough to elect Governor Davis, but were not good enough to recall him. Proponents planned to appeal the postponement to the U.S. Supreme Court. However, an 11-judge en banc panel, also from the ninth U.S. Circuit Court of Appeals and quickly and carefully canvassed by Judge Alex Kozinski, gathered to rehear the controversial case. On the morning of September 23, the panel reversed the three-judge ruling in a unanimous decision, arguing that the concerns about the punch-card ballots were outweighed by the harm that would be done by postponing the election. Polls also showed that the two leading candidates, Lt. Governor Cruz Bustamante, a Democrat, and Hollywood actor Arnold Schwarzenegger, a Republican, were neck and neck with about 25–35% of the vote each, and Bustamante with a slight lead in most polls. Republican State Senator Tom McClintock also polled in the double-digits. Remaining candidates polled in the low single digits. Polls in the final week leading up to the election showed support for Davis slipping and support for Schwarzenegger growing. 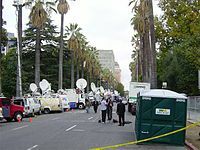 Many observers outside California, and some members of the press, consistently called the recall chaos and madness as well as a media circus and nightmare. With the candidacies of a few celebrities and many regular Californians, the entire affair became a joke to some (there were tongue-in-cheek references to Schwarzenegger's role within the science fiction film Total Recall) as well as an "only-in-California" event. Nevertheless, most Californians took the recall seriously, with the future of the governor's office at stake. The election drew in many Californians who had never voted before and voter registration increased. Counties then had seven days from the conclusion of canvassing (November 11, 2003, 35 days after the election) to submit their final vote totals to the California Secretary of State's office. The Secretary of State had to certify the final statewide vote by 39 days (until November 15) after the election. The vote was officially certified on November 14, 2003. Once the vote was certified, governor-elect Schwarzenegger had to be sworn into office within ten days. His inauguration took place on November 17, 2003. 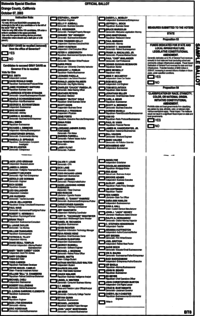 Note that San Bernardino County did not report write-in votes for individual candidates. This page was last edited on 8 March 2019, at 01:45 (UTC).